We are using DCS AIU with Tortoise switch machines and need some help. I found where you discussed this with a former member in 2016, gave him a part number, etc. We want to use the remote and, if it is practical to possibly also use a control panel. We want to use the AIU switch ports so that the route feature is available rather than the accessory ports. The latching relays are beyond me and you obviously understand it well. We need to connect 25 plus Tortoises and would like to review this with you. I am not electrically inclined but have a friend who is an electrical contractor and his three boys like to run trains; he is helping us. We worked on this for six hours Saturday with minimal success so he went and got the boys and we ran trains for two hours. Something accomplished. At present, the switch machines are wired and working using Touch Toggles. We did this on a temporary basis until we got all of the first level track and turnouts on the layout completed. We are about there and are trying to figure out the next steps. I looked for your e-mail address but didn’t see one. Would you contact me at oldhokie70@charter.net, at (747) 334-4046, or we can try it here? We are also need to figure out how to control different track blocks using the remote. you probably saw this as well but posted it for others. Thanks. This is what we were working with Saturday. 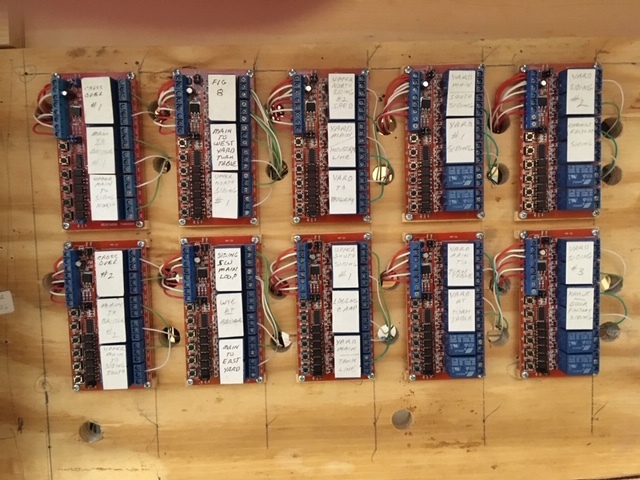 Ray, my contractor friend, took the time to explain and show the relays to me and how they work, then we discussed how DC current works, then looked at how to wire the relay, and finally we were ready to hook up the AIU. I had planned to do it before he arrived but he was an hour early. As luck would have it, the straight out of the box AIU didn’t work. We debated the locking relays with the switch ports vs the use of diodes with the acc ports. Diodes appears to be easier but it looks as if you give up the route function using them. That is a no go. Two more AIUs are on order and another TIU. 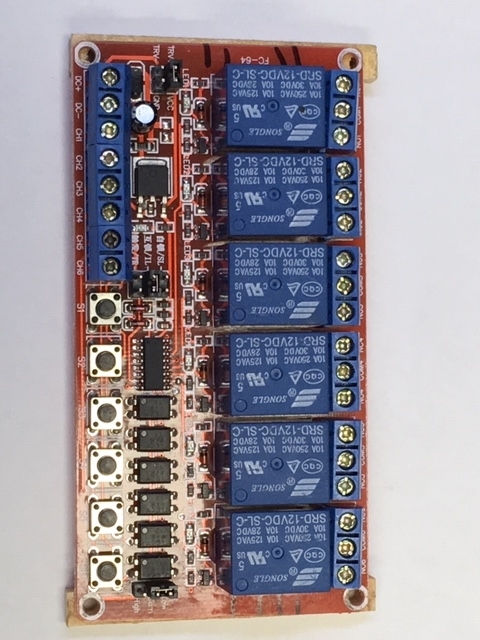 Four 12 volt DC wall worts arrived Monday, This morning I found where Stan 2004 helped someone else and used a twin coil relay that appears to me to reduce the number of relays that are required BUT which requires more soldering, etc. Ray leaves for a week at Disneyworld Saturday AM and I am trying to have what we need when he returns. If you don’t mind, we will contact you after he gets back and the AIU arrives so that we can be sure that we are correct in what we are doing. Our second question. 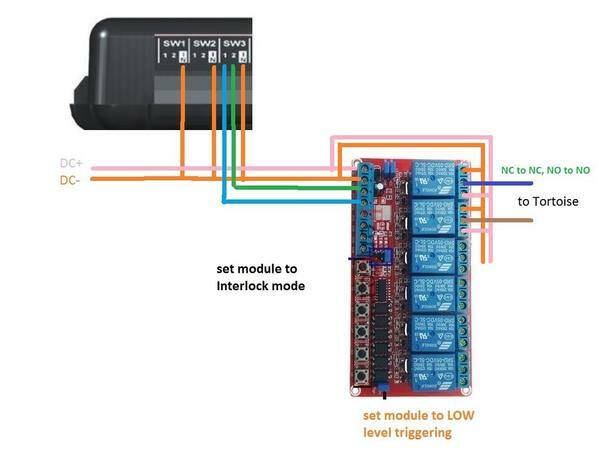 How do we wire track power using the acc ports. 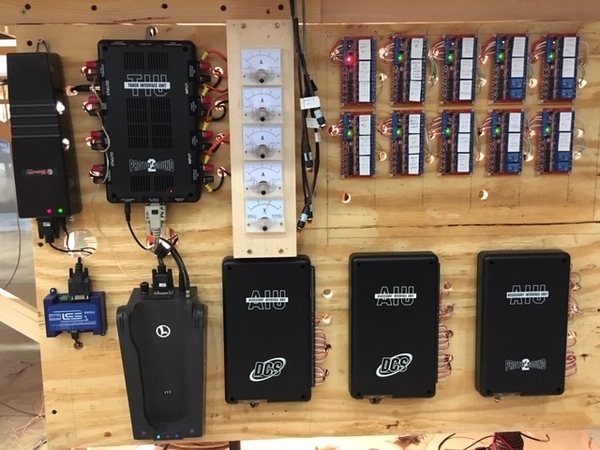 We want to be able to turn off the power to individual yard tracks, sidings, etc using the remote and, possibly down the road, a control panel. I had just as well ask my third question which is about new engine setup. How is this best done without having to take every engine off the layout? Will it work if there are no engines but the one to be added on track powered by Fixed voltage input 1 on the TIU? We have read Barry’s book but still have questions about what is needed/how to do. I assume these questions are still directed for Stan to answer. However your third question is pretty simple to answer. Especially in that you wish to have sidings that will be turned off when not in use. So you could have a dedicated siding that is used to add engines with. I would recommend plugging a remote directly into the TIU controlling that siding. You would power down any other tracks connected to that specific TIU and only have the "programming" track on. By plugging the remote directly into it, the remote and that TIU will only talk to each other. The radios are disconnected. All of this is in Barry's book I believe. Update. Most of this info is consolidated/recycled from earlier OGR posts which I found using the OGR Advanced Search tool, looking for Contains All of These Words: "Tortoise AIU" and Posted By my username: "stan2004". Or click on the following link which hopefully gets you the same result. So here's my summary of the Tortoise issue using AIU SW(itch) ports; I'll address the block control issue using AIU ACC(essory) ports separately. I see you already have 12V DC wall-warts so I'm going to assume the issue of a DC power source does not need review. The suggested relay has so-called Quick-Connect terminals, sometimes called blade or Faston terminals which are convenient if you have them. Otherwise I suppose you can solder to the 10 terminals running the wires per the diagram. Or you can buy a mating socket which routes the 10 relay terminals to screw terminals. But now you're pushing $40 per Tortoise! And you have 25 Tortoises... YIKE$. To give MTH the benefit of the doubt, I think they were just trying to illustrate the concept. You can use a much more economical DPDT latching relay that runs about $2 and is widely available - for example from DigiKey which is a US distributor popular amongst the OGR DIY'ers. You would have to solder wires to the 10 terminals using the MTH diagram. 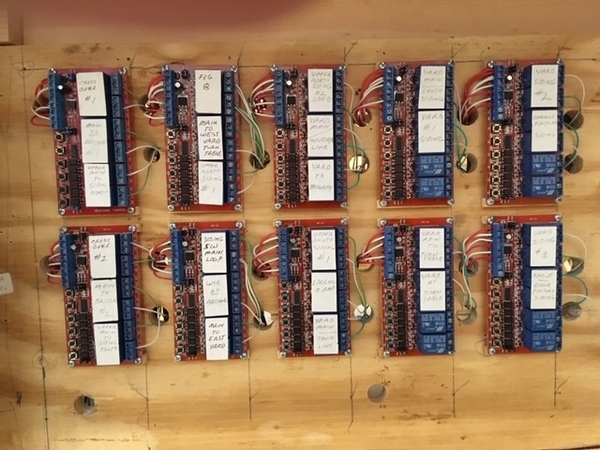 So here there are 9 screw-terminals, as 2 of the 10 relay terminals are shared in the configuration suitable for driving a Tortoise from an AIU SW port. I didn't look closely but the relay that Azatrax uses on their assembled module may even be the $2 bare relay suggested above! 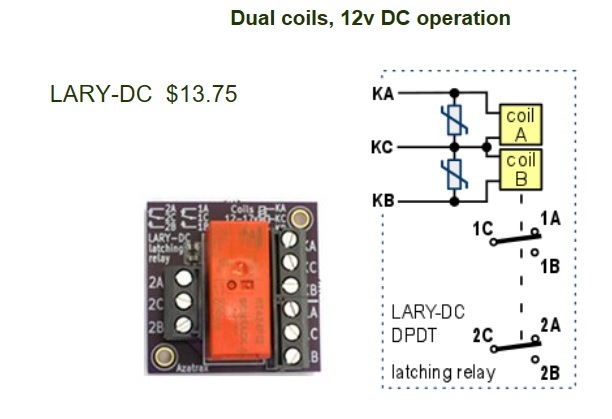 In this post, I provided some ideas on what it involves to mount/wire the bare relays. 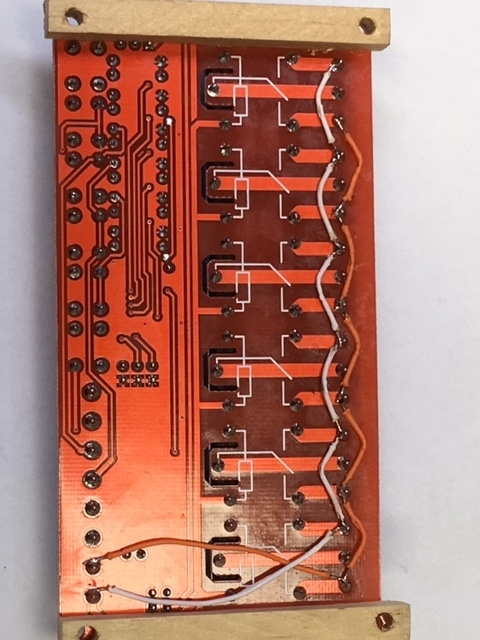 In the last year or so, there has been a flurry of activity here with guys designing their own bare circuit boards for projects like this. This has come about because of "free" software to design the printed-wire boards and remarkably inexpensive board fabrication sources. Duplicating the Azatrax might be around $2 for the bare board in small quantity...but obviously someone would have the do the design. And I'll throw in yet another idea explained in this OGR thread. This uses a ~$10 latching relay module that has 6 relays. Using 2 relays per SW port, you can control 3 Tortoises. So only $3-4 per Tortoise...but the key is no-soldering required. The explanation (a.k.a. the fine-print ) can make one's head spin, but as discussed in the linked thread, another OGR member tried it and it works - including ability to use with the DCS "Route" function to set up all your Tortoises which I realize is a "must-have" requirement. Finally, I see Joe ferreted out another arguably hare-brained alternative use essentially "makes" a latching relay out of non-latching relays. 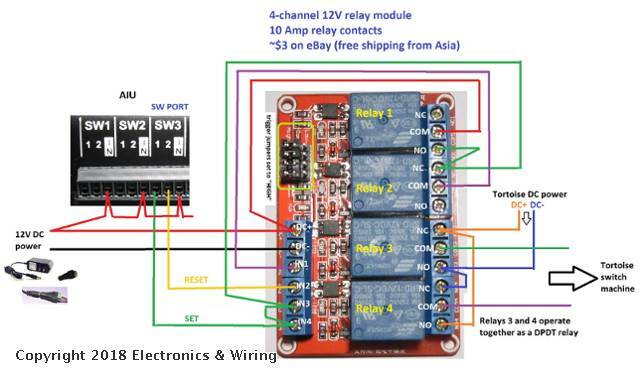 It's just that these relay modules from eBay have become so ridiculously inexpensive (with free shipping from Asia). Yes, lots of wiring, but then only $3 out-of-pocket and no-soldering! As discussed in the linked discussion, I'd say it's more food-for-thought than a practical solution. 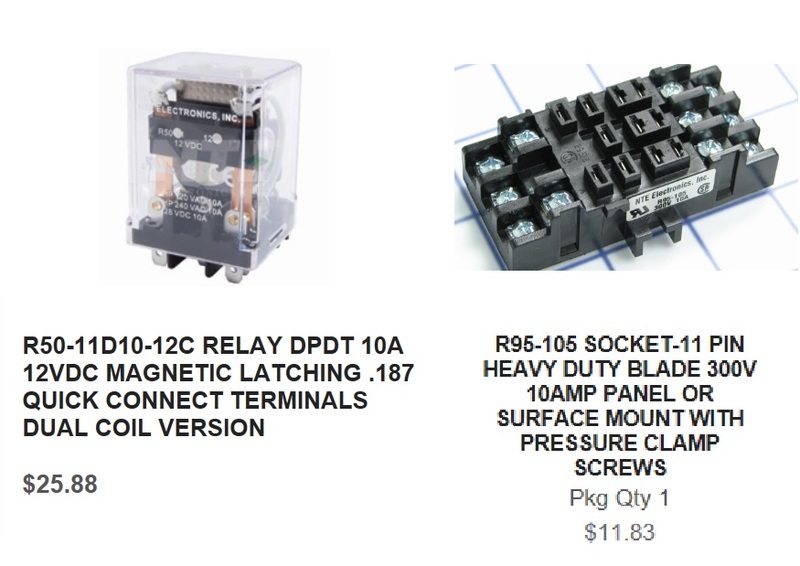 So these should give you some ideas for the DPDT dual-coil latching relay part of your question. Your other key requirement is ability to co-operate with a control panel - so either the AIU or control panel buttons can throw the Tortoises. Consider the following diagram recycled from one of the above linked threads. So far what I described have been alternatives to what goes in the tiny box labeled "DPDT latching relay" in above diagram. If you want simultaneous ability to control the Tortoise with control panel pushbuttons, then wire in two momentary pushbuttons as shown. Or, as shown, you could also use momentary 3-position (center-off) spring-loaded toggle type switches which would then only require drilling one switch hole per Tortoise in your panel. Hopefully this provides the Reader's Digest version of earlier threads. No doubt there are some details I failed to consolidate here so slog through the earlier threads... or feel free to ask for clarification! Thanks so much guys. We really appreciate the assistance. Will continue to watch and handle the siding and remote as soon as it arrives. Will continue to watch here. In case you didn't get an OGR notification, see my updated post above about the Tortoise scenario. There have been other threads on this topic. I was trying to figure out how to condense it to the Reader's Digest version but it really depends on exactly what you're trying to do. That is, if you can slog through the above thread without falling asleep or pulling your hair out , one of the land-mines you might step on is the so-called DCS watchdog issue, conundrum, rabbit-hole, whatever. Specifically, when turning on DCS command track power to a siding, roundtable spoke, yard spur, etc., you really want any engine on that section to powerup silent and in command-mode shutdown. Unfortunately, the way the TIU operates, this can be a challenge depending on how you wire things up. The above thread meanders its way toward this issue. I think it's kind of instructive to follow the thread to see how the thinking evolves. 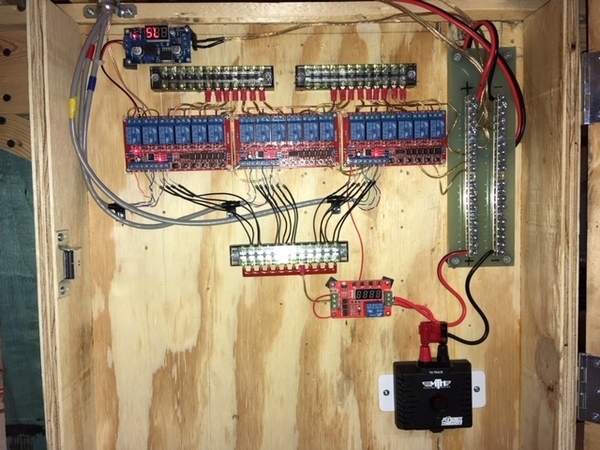 Your additional interest/requirement of controlling power to track blocks/sections via either the AIU or a control panel needs additional clarification. For a particular section, what happens if the control panel switch is set to "ON" when the AIU ACC port is set to "OFF"...or vice versa. Or do you want a "master" selector switch which determines that the control panel is active (and ignore AIU ACC ports)...or that the AIU ACC ports are active (and ignore the control panel). Or maybe you want it to behave like a 3-way light switch in your home where either switch can turn the light on/off. So if you can review some of the issues and drill down to exactly what you're after I think we can set you up in short order. But gazing into my crystal ball, I predict one or more of those $1/relay eBay modules will soon be your friend. I'll add to Stan's post on this matter as I was the one that asked for "A little relay Help". I followed Stan's advise and it worked out pretty good. The only down side (if you want to call it that) would be that the relays (two per switch) can only be trigger one at a time. this means that when you trigger another switch within the same grouping the other one loses it's energy and relaxes the switch motor a bit. I overcame this by adding .040 thick wire to the Tortoise machines. That way there is still plenty of tension left in the wire to keep the points of the switch closed in which ever direction it's in. A big thanks to Stan on this one. 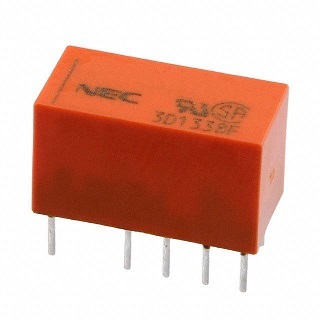 Here are the relays I used. I prewired mine (second pic) on the bottom so I wouldn't have to mess around trying to stuff all those wires into the relays. A word of caution, I purchased another batch on replays to facilitate wiring up my roundhouse and whisker tracks off the turntable and they are trigger with a negative (DC-) feed. My original batch used a 12V DC+. Thanks both of you. I have a lot of reading to do and will be back to you . The pictures of all the wiring are a bit intimidating but it’s one unit at a time. I am sure that I will have questions. We appreciate the time and work that you have put into putting this together. Stan I will think thru the power blocks questions and what the primary needs are. I suspect that if we can have a remote that will control the blocks easily and quickly, it will be enough for now. I don’t have any experience with how much can be handled practically with a remote vs a control panel and will probably ask for suggestions.